In this image from ESO's Very Large Telescope (VLT), light from blazing blue stars energises the gas left over from the stars' recent formation. The result is a strikingly colourful emission nebula, called LHA 120-N55, in which the stars are adorned with a mantle of glowing gas. Astronomers study these beautiful displays to learn about the conditions in places where new stars develop. LHA 120-N55, or N55 as it is usually known, is a glowing gas cloud in the Large Magellanic Cloud (LMC), a satellite galaxy of the Milky Way located about 163 000 light-years away. N55 is situated inside a supergiant shell, or superbubble called LMC 4. Superbubbles, often hundreds of light-years across, are formed when the fierce winds from newly formed stars and shockwaves from supernova explosions work in tandem to blow away most of the gas and dust that originally surrounded them and create huge bubble-shaped cavities. The material that became N55, however, managed to survive as a small remnant pocket of gas and dust. It is now a standalone nebula inside the superbubble and a grouping of brilliant blue and white stars—known as LH 72—also managed to form hundreds of millions of years after the events that originally blew up the superbubble. The LH 72 stars are only a few million years old, so they did not play a role in emptying the space around N55. The stars instead represent a second round of stellar birth in the region. The recent rise of a new population of stars also explains the evocative colours surrounding the stars in this image. The intense light from the powerful, blue-white stars is stripping nearby hydrogen atoms in N55 of their electrons, causing the gas to glow in a characteristic pinkish colour in visible light. Astronomers recognise this telltale signature of glowing hydrogen gas throughout galaxies as a hallmark of fresh star birth. 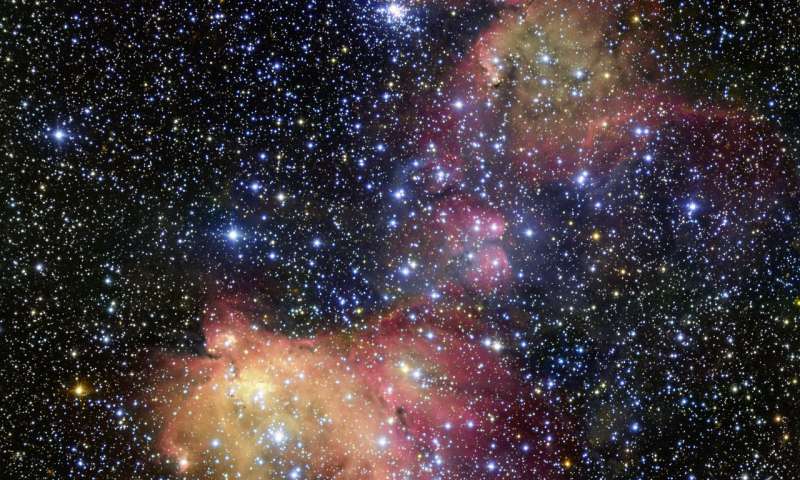 While things seem quiet in the star-forming region of N55 for now, major changes lie ahead. Several million years hence, some of the massive and brilliant stars in the LH 72 association will themselves go supernova, scattering N55's contents. In effect, a bubble will be blown within a superbubble, and the cycle of starry ends and beginnings will carry on in this close neighbour of our home galaxy. This new image was acquired using the FOcal Reducer and low dispersion Spectrograph (FORS2) instrument attached to ESO's VLT. It was taken as part of the ESO Cosmic Gems programme, an outreach initiative to produce images of interesting, intriguing or visually attractive objects using ESO telescopes for the purposes of education and public outreach. The programme makes use of telescope time that cannot be used for science observations. All data collected may also be suitable for scientific purposes, and are made available to astronomers through ESO's science archive. Amazing! It is wonderful what one can do with 8.2 m telescopes.